The Centers for Disease Control and Prevention estimates that 15 percent of the U.S. population, or 48 million people, have some type of tinnitus, hearing a ringing or buzzing in the absence of an external sound source. Pulsatile tinnitus, in contrast, usually has a sound source. In these cases, affecting fewer than 10 percent of tinnitus patients, sounds are caused by turbulence in the blood flow around the ear. And among these cases, intracranial hypertension comprises about 8 percent of cases. This is when narrowing in one of the large veins in the brain causes a disturbance in the blood flow, leading to the pulsatile tinnitus. Dural arteriovenous fistula, MRA showed only subtle alterations as a result of atypical flows in the right transverse sinus (arrow). Photo courtesy of Deutsches Ärzteblatt International. “Traditionally there has been no good treatment for many of these patients who are told to learn to live with it,” says Athos Patsalides, M.D., an interventional neuroradiologist at New York City’s Weill Cornell Medicine Brain and Spine Center, where he also serves as an associate professor of radiology in neurological surgery. Till now, available treatments—medication or more complicated surgery—were either ineffective or produced side effects and other problems just as bad or worse. 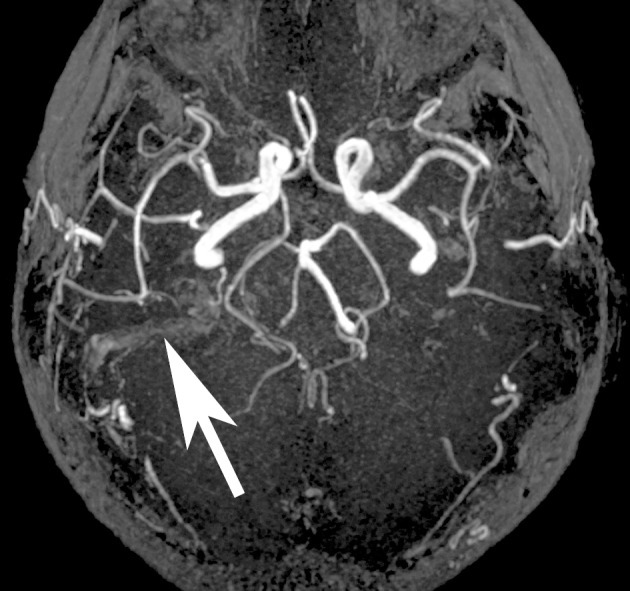 “That’s why we started the clinical trials for venous sinus stenting, a minimally invasive procedure that is very effective in alleviating the narrowing in the vein,” says Patsalides, who pioneered the use of VSS to treat patients with idiopathic intracranial hypertension (IIH), also known as pseudotumor cerebri because the symptoms tend to mirror those of a brain tumor. “Many IIH patients suffer from vision loss, headaches, and pulsatile tinnitus, and I saw a pattern with patients experiencing resolution of the pulsatile tinnitus immediately after VSS,” Patsalides says. This led to the possibility of using VSS for selected patients with pulsatile tinnitus. After the Food and Drug Administration approved the clinical trial, it began in May 2016 and has an estimated completion date of January 2021. “In the stenting procedure, with the patient under general anesthesia, we insert a tiny, soft catheter into a vein located in the upper part of the leg and thread it up to the affected vein in the brain,” Patsalides says. A self-expanding stent is deployed into the narrowed segment of the vein, relieving the stenosis, restoring normal blood flow, and reducing or eliminating the pulsatile tinnitus. “Happily, the patient is typically discharged from the hospital within 24 to 48 hours,” he says. To learn more, see weillcornellbrainandspine.org. Hearing Health Foundation notes that the trial is ongoing, and that the procedure is potentially able to address only one specific cause of pulsatile tinnitus and should not be taken as a solution for other forms of tinnitus, which often has no known cause. You can empower work toward better treatments and cures for hearing loss and tinnitus. If you are able, please make a contribution today. The competitors in this year’s Winter Olympics are full of drive and determination. Olympians throughout history have overcome various challenges for a chance to win the gold, including hearing loss. Hearing loss has played a big role in the lives of some Olympians. In spite of their disability, or, perhaps, because of it, hard-of-hearing Olympians have thrived as athletes. Rather than viewing their hearing loss as a limitation, these Olympians—our very own Gold Medalists—have claimed that compromised hearing has shaped their work ethics and contributed to their success. American Figure skater Adam Rippon. Credit: Jim Gensheimer/Bay Area News Group. Adam Rippon is a figure skater participating in the 2018 Olympics. He was born with an eye infection and 80% hearing loss. Before his first birthday, he had major surgeries to correct both issues. At age 5, he survived a bursted appendix and severe respiratory condition. Despite his early health difficulties, he won a gold medal at the Four Continent Championship and the national title in 2016. Frank Bartolillo is an Australian fencer who competed in the 2004 Olympics. He was born with hearing loss, but Bartolillo states that his hearing loss has actually helped him improve his fencing skills by allowing him to fully focus on his opponent. Carlo Orlandi was an Italian boxer. At age 18, Orlandi became the first deaf athlete to compete and win a Gold Medal in the 1928 Olympics. Later, he became a professional boxer with a career that spanned 15 years and won nearly 100 matches. David Smith is an American volleyball player who was born with severe hearing loss. At age three, he was fitted for hearing aids in both ears. As an athlete, he relies heavily on hand signals and lip reading to communicate with his teammates. On the court, Smith can’t wear his hearing aid, so his coach, John Speraw, uses the “David Smith Rule.” This rule mandates that “when David wants it, David takes it,'" says Speraw. "Because in the middle of a play, you can't call him off...He's mitigated any issues he has by being a great all-around volleyball player." Chris Colwill is an American diver who was born with hearing loss. Although his hearing aid allows him to hear at an 85-90% level, he can not use it while diving and relies on the scoreboard for his cue to dive. But Colwill stated that this is an advantage for him—noise from the crowd doesn’t distract his concentration on diving. Katherine Merry is a former English sprinter who won a Bronze Medal in the 2000 Olympics. At age 30, she developed tinnitus when a nurse made a mistake during a routine ear cleaning procedure. Ever since, she has lived with a constant high-pitch buzzing sound in her ears. It becomes worse when she is tired, overworked or on a flight. Today, Merry works as a BBC Sports Presenter. These Olympians prove that those affected by hearing loss can pursue successful careers in sports. Refusing to let anything hold them back, they turned their disabilities into advantages in their respective competitions. Hearing loss allows them to block out distractions and focus on the sport. Their disability has shaped their determination, forcing them to become stronger and better athletes. October is Protect Your Hearing Month—and, today, October 10, is World Mental Health Day, a time for mental health education, awareness, and advocacy. Hearing loss and tinnitus (ringing in the ears) can increase one’s risk of developing mental illnesses including depression, anxiety, schizophrenia, and dementia, and can trigger episodes of extreme anger and suicidal ideation. 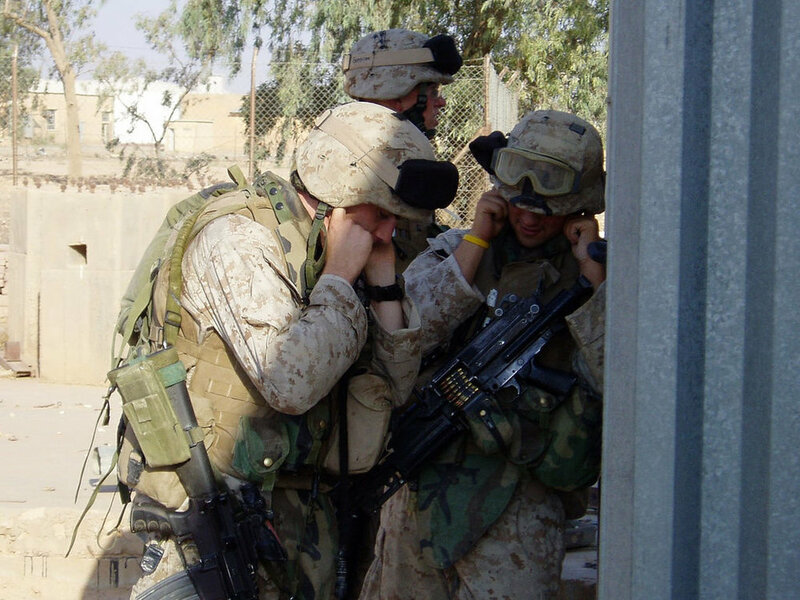 Protecting one’s hearing not only prevents or delays hearing loss, but also benefits mental wellness. Understanding the signs of mental illness and having access to mental health resources is critical—and can even be life-saving—to all individuals with hearing loss or tinnitus. According to an April 2014 study published in JAMA Otolaryngology Head & Neck Surgery, 11.4% of adults with self-reported hearing impairment have moderate to severe depression, significantly higher than the 5.9% prevalence for those with typical hearing. Individuals with hearing loss have reported feeling socially inept in group settings, entering conversations at inappropriate times, talking off-topic, or dominating conversations and coming across as rude simply because talking is easier than listening. When a person cannot hear properly, engaging in conversations is a daily struggle, and can lead to social isolation and depression. Other factors that increase the risk of depression include being female, low-income, a current smoker, binge drinking, having fair or poor health status, trouble seeing, and sleep disorder. However, even controlling for these factors, those with hearing impairment still had significantly higher rates of depression than those without hearing impairment. In people 65 and older, hearing impairment is among the most common chronic conditions associated with depression. In addition to depression, hearing loss has been linked to schizophrenia. Several studies support the social defeat hypothesis, which proposes that social exclusion and loneliness can predispose people to schizophrenia by increasing sensitization of the dopamine system. In a December 2014 study published in JAMA Psychology, participants with hearing loss reported significantly more feelings of social defeat than healthy controls. Though their psychotic symptoms were similar to the control group, exposing them to a stimulant drug showed that those with hearing loss had significantly higher than normal dopamine sensitivity. Further studies are needed to draw definite conclusions of the causation, but this research is a first step in understanding the relationship between hearing impairment, social defeat, and psychosis. In older adults, hearing loss is associated with cognitive decline and dementia, according to a February 2013 study published in JAMA Internal Medicine and several other studies conducted at Johns Hopkins University. The scientists concluded that reduced social engagement and a cognitive load focused on coping with hearing loss rather than higher level thinking can lead to poorer cognitive functioning and faster mental decline. Hearing aids could possibly be a simple fix to increase healthy brain function in the older adult population and reduce the risk of dementia. Exposure to noise often results in tinnitus instead of or in addition to hearing loss, which can also contribute to a range of psychological disorders. Tinnitus affects about 1 in 5 people in the U.S., and causes permanent ringing in the ears. Though research for therapies is ongoing, there is currently no cure. Without therapy, constant ringing in the ears can be debilitating; it can affect job performance, cause insomnia, and provoke fear, anxiety, and anger. This can lead to depression, anxiety, suicidal ideation, and can exasperate post-traumatic stress disorder (PTSD). Compromised hearing is an invisible disability, often unnoticed or ignored even by those affected. However, hearing loss and tinnitus are widespread and can have serious psychological repercussions. Hearing loss caused by noise exposure is completely preventable by taking simple measures like turning down the volume on your earbuds and using hearing protective devices in loud situations. Regular hearing screenings can also help detect hearing issues early on. Talk to your audiologist about best ways to treat or manage your hearing impairment. Find help for mental illnesses here. By Kelly Radziwon, Ph.D., and Richard Salvi, Ph.D.
One of the defining features of hyperacusis is reduced sound level tolerance; individuals with “loudness hyperacusis” experience everyday sound volumes as uncomfortably loud and potentially painful. Given that loudness perception is a key behavioral correlate of hyperacusis, our lab at the University at Buffalo has developed a rat behavioral model of loudness estimation utilizing a reaction time paradigm. In this model, the rats were trained to remove their noses from a hole whenever a sound was heard. This task is similar to asking a human listener to raise his/her hand when a sound is played (the rats receive food rewards upon correctly detecting the sound). FIGURE: Reaction time-Intensity functions for broadband noise bursts for 7 rats. The rats are significantly faster following high-dose (300 mg/kg) salicylate administration (left panel; red squares) for moderate and high level sounds, indicative of temporary loudness hyperacusis. The rats showed no behavioral effect following low-dose (50 mg/kg) salicylate. By establishing this trained behavioral response, we measured reaction time, or how fast the animal responds to a variety of sounds of varying intensities. Previous studies have established that the more intense a sound is, the faster a listener will respond to it. As a result, we thought having hyperacusis would influence reaction time due to an enhanced sensitivity to sound. In our recent paper published in Hearing Research, we tested the hypothesis that high-dose sodium salicylate, the active ingredient in aspirin, can induce hyperacusis-like changes in rats trained in our behavioral paradigm. High-dose aspirin has long been known to induce temporary hearing loss and acute tinnitus in both humans and animals, and it has served as an extremely useful model to investigate the neural and biological mechanisms underlying tinnitus and hearing loss. Therefore, if the rats’ responses to sound are faster than they typically were following salicylate administration, then we will have developed a relevant animal model of loudness hyperacusis. Although prior hyperacusis research utilizing salicylate has demonstrated that high-dose sodium salicylate induced hyperacusis-like behavior, the effect of dosage and the stimulus frequency were not considered. We wanted to determine how the dosage of salicylate as well as the frequency of the tone bursts affected reaction time. We found that salicylate caused a reduction in behavioral reaction time in a dose-dependent manner and across a range of stimulus frequencies, suggesting that both our behavioral paradigm and the salicylate model are useful tools in the broader study of hyperacusis. In addition, our behavioral results appear highly correlated with the physiological changes in the auditory system shown in earlier studies following both salicylate treatment and noise exposure, which points to a common neural mechanism in the generation of hyperacusis. Although people with hyperacusis rarely attribute their hyperacusis to aspirin, the use of the salicylate model of hyperacusis in animals provides the necessary groundwork for future studies of noise-induced hyperacusis and loudness intolerance.